Ms Yuan Yao and Professor Andrew Roberts. 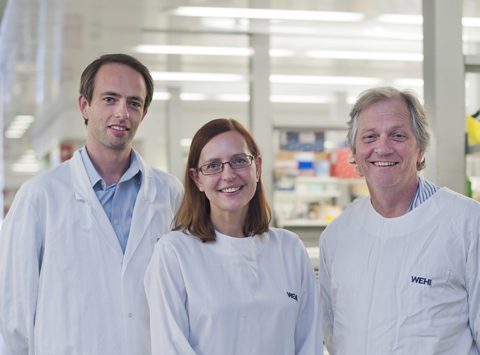 Our researchers have discovered a new target for treating multiple myeloma, an incurable bone marrow cancer. The research revealed that the majority of myelomas rely on a protein called MCL-1 to stay alive. Potential drugs that inhibit MCL-1, which are in pre-clinical development, may be a promising new treatment for multiple myeloma. Each year more than 1700 Australians are diagnosed with multiple myeloma, which is a cancer of immune cells called plasma cells. Currently available treatments are only able to halt the progression of the disease and relieve symptoms, but cannot cure the disease. Walter and Eliza Hall Institute researchers Dr Jianan Gong, Dr David Segal, Ms Yuan Yao, Professor Andrew Roberts and Professor David Huang, working with researchers at the Australian Centre for Blood Diseases, Monash University and the Alfred Hospital, investigated the ‘survival proteins’ that keep myeloma cells alive, allowing the cancer to persist. The survival of many cancer types relies on a family of related survival proteins called BCL-2 family proteins, Professor Huang said. “In the past decade there has been considerable interest in the using anti-cancer agents called ‘BH3-mimetics’ to kill cancer cells by blocking the BCL-2 family proteins,” he said. “Recent clinical trials have demonstrated that a BH3-mimetic that switches off the protein BCL-2 is an effective treatment for certain forms of leukaemia. “Our latest research has focused on which BH3-mimetics would be the most effective in treating multiple myeloma, a cancer for which new treatments are urgently needed,” Professor Huang said. Dr Gong said the team discovered that the majority of myeloma samples died when MCL-1 was switched off. “In contrast, only around one-quarter were susceptible to inhibiting BCL-2,” she said. “This finding is in keeping with earlier research at the Walter and Eliza Hall Institute that pinpointed MCL-1 as the likely protein that keeps myeloma cells alive. “Our research shows that switching off MCL-1 has the potential to be effective new treatment approach for the majority of patients with myeloma,” Dr Gong said. The research was published in the journal Blood. Ms Yao is a medical student Tsinghua University, Beijing, who is a visiting Masters student at The University of Melbourne. Professor Roberts is a clinical haematologist at The Royal Melbourne Hospital and holds the Metcalf Chair of Leukaemia Research at The University of Melbourne. The research was supported by the National Health and Medical Research Council, Cancer Council Victoria, the US Leukemia and Lymphoma Society, the Australian Cancer Research Foundation, the China Scholarship Council and the Victorian Government Operational Infrastructure Support Scheme.